House Of Dragons is a rather unique Chinese themed slot game from the developers at Microgaming. You get 20 paylines that you can activate with wagers of up to 100 per spin. The bonus features include a unique gambling style game of archery. 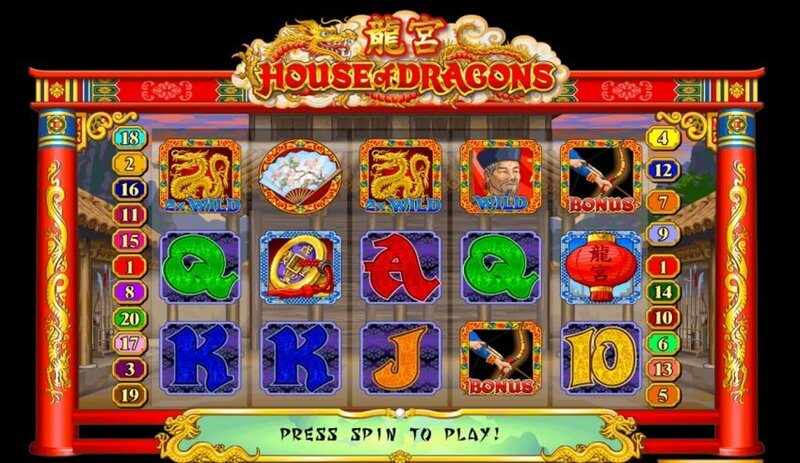 House Of Dragons allows players to activate an Autoplay option so you can set up customised automatic spins. This slot also features 2 unique wild symbols, along with a fan scatter symbol that can add multipliers to your payouts. There are big prizes on offer of up to 10 000x your line wager, but only if you dare to step into the house where the dragon lives. The unique House Of Dragons bonus game is an archery minigame. It is activate by the bow symbol. Depending on weather you land 3, 4 or 5 of these icons in a row, you can win up to 1600x as well as an up to 4x multiplier of the wins. When the House Of Dragons archery game starts, you will get to choose one of four targets for your archer to fire at. Each target has 2 to 3 target areas. If you miss the bull’s eye, you will forfeit your entire wager. Luckily at the start of the online pokies NZ game you can either take a risk to play the archery game and earn a multiplier, or you can simply click on the collect option to bank your earnings. The beautifully decorated paper fan symbol has two functions. Firstly it is the House Of Dragons scatter symbol. It pays out prizes for 3 to 5 fans that land anywhere on the reels. Its second function is to activate a special fan picking bonus game. Depending on how many scatter fans land, you will get to click on the fans to reveal multipliers. Each multiplier will stack with the previous multiplier. You can get an up to 32x your total wager prize. House Of Dragons has a detailed golden dragon symbol that can substitute for any standard symbol. This wild cans also double any payout it is part of. Along with this great doubling feature, the wild can also award between 15x and 10 000x your line bet. The payouts increase the more wilds you can match on a payline with prizes of 15x, 200x, 2000x and the jackpot 10 000x prize. House Of Dragons also features a second standard wild symbol. It features a Chinese emperor on the symbol. This wild is also a substitute symbol but it won’t double your payouts and its prizes are half that of the golden dragoon wild. This means its minimum payout is 5x and its maximum payout is 5000x. The House Of Dragons reels mostly feature 5 stylized playing card symbols. There are only two picture symbols. One is a red paper lantern and the other is a Chinese coin. These two icons will pocket players up to 300x their line wager. The playing card symbols offer jackpots that start at 50x and end at 150x. These jackpot payouts require 5 symbols of the same kind to land on one of the paylines that you have activate with your wager coins.